This page will be updated as brackets get finalized. 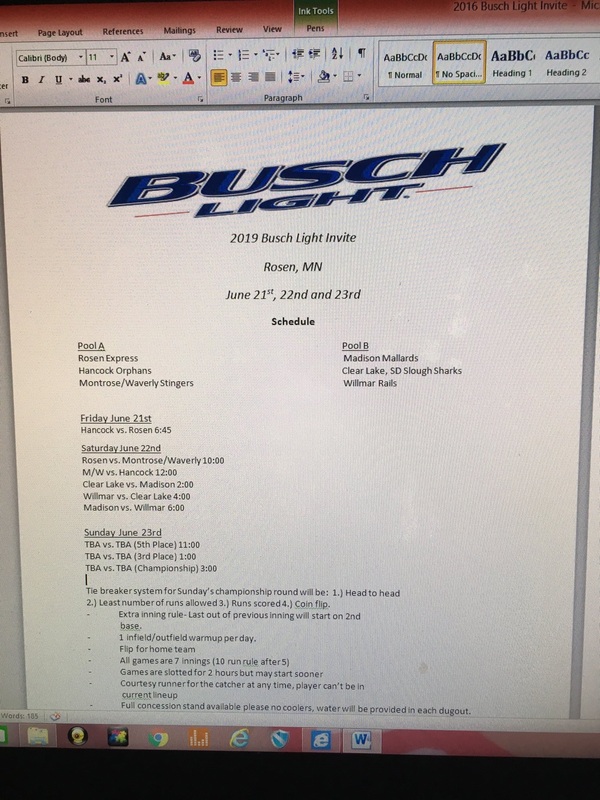 The Field: St. Stephen Steves, Sartell Muskies, Buckman Billygoats, Brookings Cubs, Nisswa Lightning, St. Anthony Hogs, Isanti Redbirds, St. Augusta Gussies. 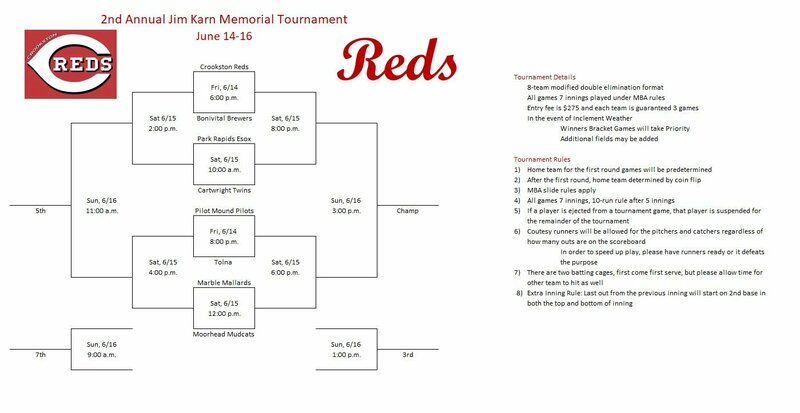 Morris Eagles vs. Chokio Coyotes, 6 p.m.
Fergus Falls vs. Starbuck, 8:30 p.m.
Raymond Rockets vs. Minneapolis Mudcats, 11 a.m.
Ada Athletics vs. New York Mills Millers, 1:15 p.m.
Loser bracket games: 1:30 p.m., 3:45 p.m.
Winner’s bracket games: 3:30 p.m., 5:45 p.m.
New Prague vs. Kewaskum, 6:30 p.m.
Cologne vs. St. Anthony, 8:30 p.m.
Wells vs. Stewartville-Racine, 11 a.m.
Blaine vs. Rogers, 1:30 p.m. 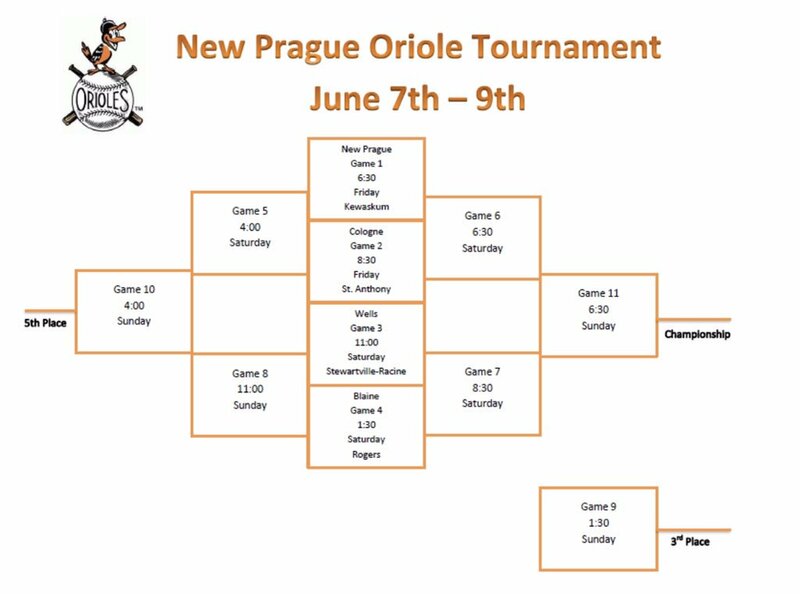 Winner's bracket games: 6:30 and 8:30 p.m.
Loser's bracket games: 4 p.m.
Loser's bracket game, 11 a.m.
Minnesota Lake vs. Belle Plaine, 6:30 p.m.
Hamburg vs. Shakopee Coyotes, 8:30 p.m.
Watertown vs. Andover, 10:30 a.m.
Minneapolis Mudcats vs. Greenwald, 12:45 p.m.
Loser's Bracket games: 3 p.m. and 5:15 p.m. Winner's Bracket game: 7:30 p.m. Winner's Bracket game: 11 a.m.
Minneota vs. Ruthton, 10 a.m.
Castlewood vs. Searles, 12:30 p.m.
Owatonna vs. TCMABL at Arlington, 6:45 p.m.
Champlin LoGators vs. Gaylord at Gaylord, 6:45 p.m. 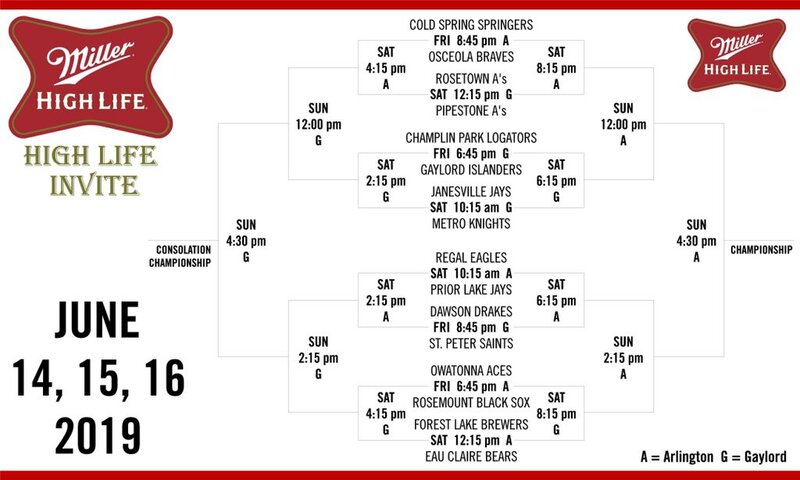 Cold Spring vs. Osceola at Arlington, 8:45 p.m.
Dawson vs. St. Peter at Gaylord, 8:45 p.m.
Regal vs. 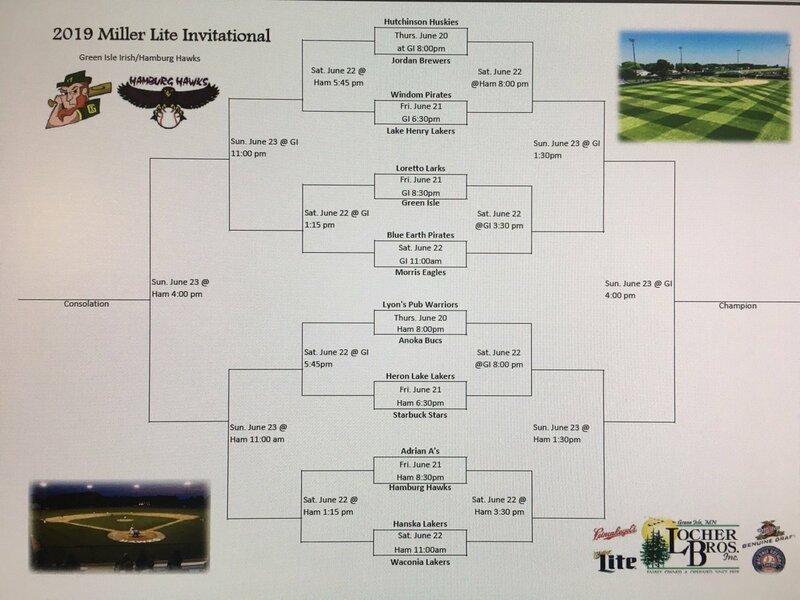 Prior Lake at Arlington, 10:15 a.m.
Janesville vs. Metro Knights at Gaylord, 10:15 a.m.
Forest Lake vs. Eau Claire at Arlington, 12:15 p.m.
Rosetown vs. Pipestone at Gaylord, 12:15 p.m.
Loser's Bracket games: 2:15 and 4:15 p.m. 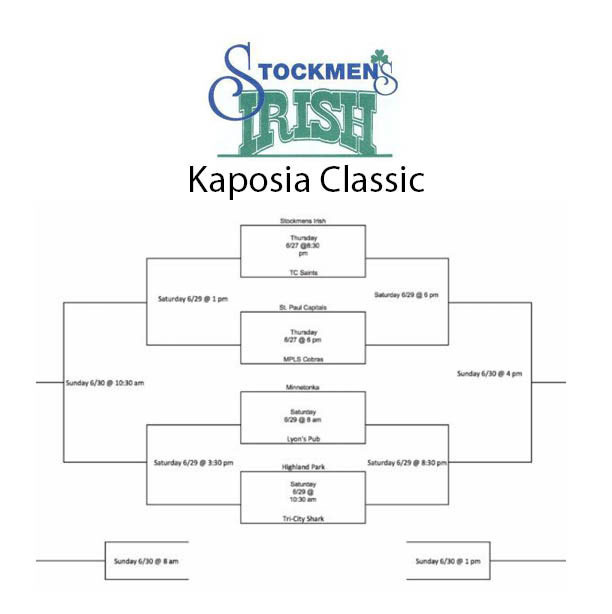 Winner's Bracket games: 6:15 and 8:15 p.m.
Loser's Bracket games: Noon, 2:15 p.m., 4:30 p.m. Winner's Bracket games: Noon, 2:15 p.m.
Crookston vs. Bonivital, 6 p.m. Pilot Mound vs. Tolna, 8 p.m.
Park Rapids vs. Cartwright, 10 a.m. Winner's bracket games: 6 p.m. and 8 p.m.
Loser's bracket games: 2 p.m. and 4 p.m.
Bird Island vs. Atwater, 6 p.m.
Minneapolis vs. Luverne, 8 p.m.
Brookings vs. Atwater, 10:30 a.m.
Luverne vs. Atwater, 12:30 p.m.
Luverne vs. Bird Island, 4:30 p.m.
Brookings vs. Minneapolis, 6:30 p.m.
Elrosa vs. Freeport, 6:30 p.m.
Sartell vs. New London-Spicer, 8:30 p.m.
Crookston vs. Long Prairie, 10 a.m. Seventh place game: 10 a.m.
Third place game: 2 p.m. The field: Farming Flames, Sartell Stone Poneys, St. Joseph Joes, Sauk Centre Titans, Belle Plaine Tigers, Atwater Chuckers, Winstead Wildcats, Maple Lake Lakers. Atwater Chuckers vs. Sauk Centre Titans, 6 p.m.
Sartell Stone Poneys vs. Maple Lake Lakers, 8 p.m.
St. Joseph Joes vs. Winstead Wildcats, 10 a.m.
Loser’s bracket: 2 p.m. and 6 p.m.
Winner’s bracket: 4 p.m. and 8 p.m.
Hancock vs. Rosen, 6:45 p.m.
Rosen vs. Montrose/Waverly, 10 a.m.
Clear Lake vs. Madison, 2 p.m.
Willmar vs. Clear Lake, 4 p.m.
Madison vs. Willmar, 6 p.m.
Mora Blue Devils vs. Elko Express, 6 p.m. Maple Plain Diamond Devils vs. Hinckley Knights, 8 p.m.
Buffalo Bulldogs vs. Minneapolis Mudcats, 10 a.m.
St. Clair Wood Ducks vs. Northfield, 12:30 p.m.
Loser’s bracket game: 3 p.m.
Winner’s bracket games: 5:30 p.m. and 8 p.m.
Loser’s bracket games: 10:30 a.m.
St. Paul Capitols vs. Minneapolis Cobras, 6 p.m.
Stockmen's vs. TC Saints, 8:30 p.m.
Minnetonka vs. Lyon's Pub, 8 a.m.
Highland Park vs. Tri-City Shark, 10:30 a.m.
Loser's bracket games: 1:30 and 3:30 p.m.
Consolation games: 8 a.m., 10:30 a.m. The field: Pool A: Jordan, Carver, Moorhead, Hampton. Pool B: Shakopee, Northfield, Cold Spring, Sacred Heart.